I first heard Dian on a pitch black night outside the Henry Miller Library, deep in the mountains of Big Sur. I had driven down to see Blame Sally and Dian, a friend of the band, opened with a reading. The ocean crashed on the cliffs far below as she wove her magic on a rough stage strung with little white lights. Tales of tiny horses on a Russian woman’s arm, of raw, mystical Furies and primal, passionate couplings. Of loneliness and rebel spirits. Of nature red in tooth and claw, but also, emphatically, wild and free. Our salvation. If we would just pay attention. I have long had an interest in poetry. Aside from a couple ancient college classes, I have no training in it but I love how the careful selection of words opens up a whole new world, a way of seeing things unexpectedly, of tapping into shared deep roots of connectedness. I especially care for poems that observe the small miracles of the natural world and make us stop and think. My bookshelf is full of conversations between the likes of Mary Oliver, Billy Collins, William Stafford, Jane Hirshfield, and now, happily, Dian’s latest. These will not be casualties of downsizing when I move into my tiny house. They are my friends on a cold winter night. I read a lot about the women of the Left Bank of Paris between the 1900s and 1940s – artists, poets, and writers such as Gertrude Stein, Anais Nin, Djuna Barnes, Colette, and many others. H.D. was part of this milieu, though choosing to live in London. A poet, she was influenced by her early lover Ezra Pound and was instrumental in developing the Imagist movement in poetry, defined by an almost haiku-like stripping of poetry down to its bare essence. “Sea Rose” wouldn’t normally have caught my attention but I stumbled upon the fact that she wrote it not long after she had a miscarriage. Richard Aldington, her husband at the time, had rather brutally informed her that her friends had died in the sinking of the Lusitania. I have no proof that the poem is a result of this experience, but the mere thought of it made me view the poem in a new light. It became the jumping off point for an experimental film, never completed, about a destitute young woman. Accompanied by the poem, the film was rife with images of a decaying amusement park at the beach, children’s airplane rides overlain with air raid sirens and the roar of divebombing WWI planes. Like the poem, it was pretty bleak, but I was fascinated by the interplay of sound, word and image. 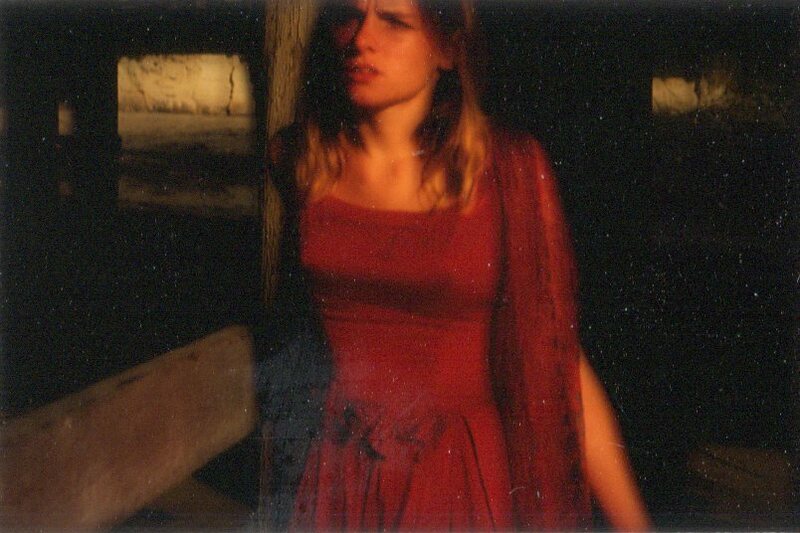 A still from Sea Rose. Fast forward a few years. Not long after that night of poetry and music in Big Sur, I began promoting women musicians and hosting a monthly series at a cafe in Berkeley. I became interested in the differences and similarities of lyrics and poetry. One of my favorite shows was a round robin of Dian reading her poetry, singer/songwriter Monica Pasqual, and Ronnda Cadle, an instrumental guitarist. They took turns performing and discussing how they work and the interconnections between the different art forms. It was an illuminating evening. Dian came back to the cafe for another reading and enthralled us with, among other things, the vivid image of a childhood battle with biting, “I’d made it nine years chewing only barnyard animals,/frosted flakes and candy, before I finally cracked,” going on to describe how she lunged for her cousin, “…aiming intuitively, for the meatiest zone/between her elbow and warm little wrist.” But again, she turns this around, irresistibly, into a plea for love and connection, and a defiant celebration of our human frailties. Brilliant. Tiny houses and poetry go hand in hand. Poetry started creeping into my blog posts – it was a natural fit with writing about tiny houses. Both focus on finding the essentials of what is needed, of tossing the extraneous, the useless words and space, the extra baggage. 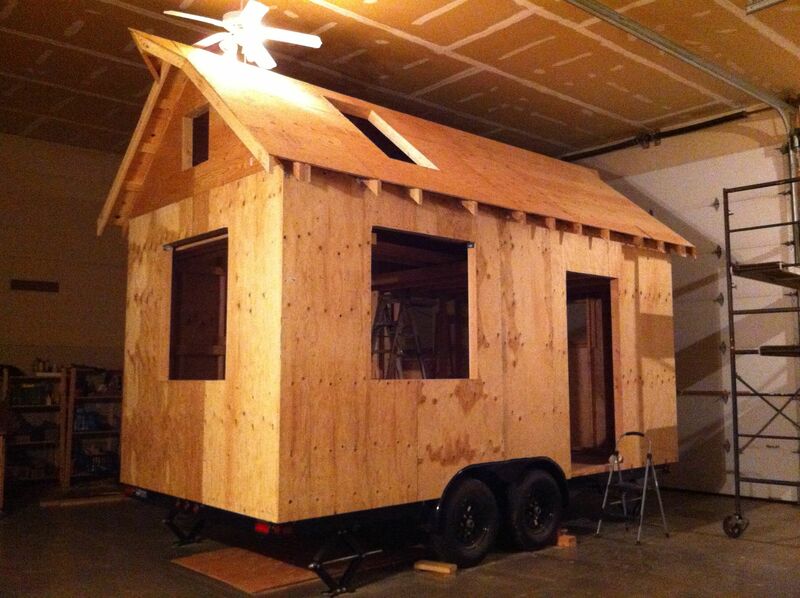 Like haiku, tiny houses are spareful. Naj Haus at the moment (Dec 2013). The exploration of nature is a common theme in each. Tiny housers speak of an increased appreciation of the changing of the seasons and the sound of wind and rain. By watching the path of the winter sun, I realized I needed to put one of my skylights on the front of the house. Already nature is infiltrating my house, even as I build. Both tiny houses and poetry challenge the way we perceive the world around us. They question whether the accepted norms are really something to blindly swallow. Perhaps we need to look at things in a new way. Perhaps not everyone needs the mansions and the mortgages. Poetry and tiny houses serve to startle us out of our ruts, to wake us up, to change are habitual patterns and perspectives. There are those who question whether this was a pure recording or a manipulation. I decided I didn’t really care. It made me stop and think about the possibility of each cricket living its life contributing to an ongoing natural harmonic choral arrangement, an evolving, living song greater than each individual. It’s not so much about the truth of the recording, as the jolt to how we perceive the world. There is so much we don’t know, so many possibilities, so many ways of walking on this earth. Both poetry and tiny houses offer more of a connection to others, to deeper truths, to a resonance with an authentic, more conscious, way of living. They can also call attention to what is out of balance, to what is broken, to what is causing us harm. And offer a path back. Reading Dian’s poetry last night, I remembered that while I was at work, banging my head on the desk, a hand tapped me on the shoulder, stuck a pair of binoculars in my hands and pointed out the window. There, about twenty flights up, above where there have been several murders in the last year, above where there is no safety net to help the poor, the hungry, the addicted, where despair and tempers are rampant, there, high above this dense, trashed, malfunctioning part of the city, perched two peregrine falcons, wild and free. Not an answer, perhaps, but a token of hope. So with that I would like to leave you with one of Dian’s poems in all its fecund glory. This poem is the introduction to The Marvels Recorded In My Private Closet. With its rallying against the repressed, soulless union of greed and shoddy construction, it seems very appropriate for tiny housers. Thank you, Dian, for letting me share it. the world with the firmament for its roof . . . I throw my old, uneaten fruit into the field next door. or cut out their wounds and put them in a pie. and a fake green thumb for quick investing. unimaginatively ecru and stupid in its inability to open up. The tightly pleating curtains never get to billow. to let in even one airy note of one breezy chord. in a wave in a tree in a volcano. Oh you lazy animists how did you let it come to this? of decaying bananas and bushels of heavy lemon cannon fire. to spread their curvy doctrine of sweet tendril and sprout. like it’s a 1600 square foot plate of sugar. under the last drooping eave. Now the hateful politics of the door are busted down. and limb opening green across the field. Dian Sousa, drinking companion and reverend to the heretical and free, is the author of Lullabies for the Spooked and Cool and The Marvels Recorded in My Private Closet. She is cofounder of the San Luis Obispo, California, chapter of CodePINK: Women for Peace. 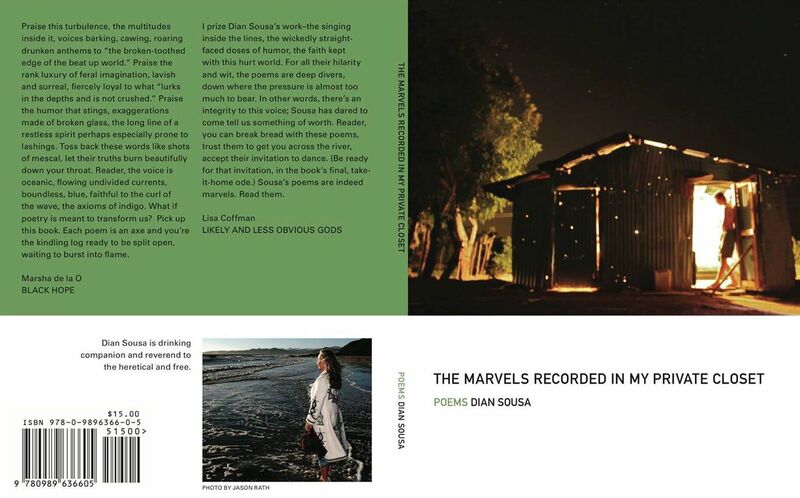 The Marvels Recorded in my Private Closet can be purchased at Big Yes Press. I love this post, thank you Kate between this post and my morning coffee I am ready to appreciate the day for what it really is. 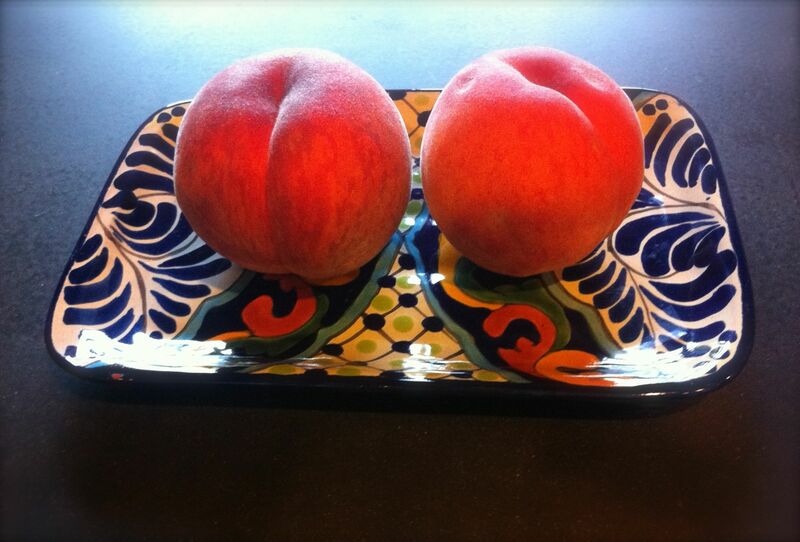 I’d like to think I would be the one to smash the peach against the side of a house, but I think I would rather smash it in my mouth. I will get Dian’s book of poems. Thanks, Derin! You will really love Dian’s book. Incredibly powerful and imaginative. I found myself reading more and more slowly so it wouldn’t end!